What topics were you discussing about at the event? What was the event all about? We attended the European Development Day (E.D.D) and we had a stand for AVSI foundation and Meeting Point International where we exhibited our products. This year’s theme was on how to include the vulnerable groups that is to say women and the girls. So generally, it was designed to help in finding a way on how women, girls, boys and men can be brought together. It was also about finding the vulnerable can enjoy and access public spaces economically, socially and recreational. So, it was all about inclusive city for all were every body of all walks of life would enjoy. There were different panels, many meetings at different panels and we were before some panelists, I also attended one session with Plan International were I told them my witness like a woman who grew up in the slum and as vulnerable woman who has worked so much to see that women are empowered through forming of groups and training them. I posed a question before the panelist, “How were we supposed to fight poverty?” As much as they are fighting for women to enjoy the public spaces, in Kampala it is a bit tricky. You find that the women are the bread winners in the place where I come from in Kireka. The women are the protagonists and want to enjoy the public spaces by using it economically. Some of these women go to town to sell their mangoes, bananas, paper beads but the KCCA (Kampala City Council Authority) authorities do not allow them in the name of cleaning up the city. But now for whom are they cleaning these cities if am to ask? Are they not cleaning the city for every body to enjoy? Is it only for the rich people to enjoy the good streets? There is no security for these women, I witnessed it, I had to go to the police cell to see that some women come out of the prison because of their arrest in the name of cleaning up the city. They arrest these women and spend three days in a cell and imagine they are the bread winners at home. What do you think happens to their children at home yet their mothers have been detained for three days? It only means that the children have to go hungry. The children have to move around and even end up stealing to get something to eat. Child abuse comes into play in this situation, since they are not supporting the children because they are arrested. Back home the child is just moving a round which puts him or her at the risk of kidnappers, those who do rituals and child sacrifices for richness. The whole household is at a risk originating from cleanup of the city which in the end is just for the minority leaving out the majority of the people who are vulnerable in the city. So, I wasn’t happy because of this. I had to present this before the panelist. How are they going to help us? How will they help the vulnerable women and girls to enjoy this pubic space yet it is being restricted from them? The women are also taken to the prison and coming out of the prison they have to spend a lot of money, come back and restart again at home. Children are left unattended to, they go hungry for days and end up stealing. In the process of stealing something to eat they are also caught, arrested and taken to cell. These children face the risk of kidnappers. When you placed this issue in front of the panelist, what was their response? Did they respond in a way that they could solve this problem? Is there a response they gave that you think can help in this current situation? The moderators gave me only two minutes which I had to use wisely. I was directed to a lady who was from Plan International, Uganda, I think she’s an American. Basically, she was talking about the safety, security of girls in Kampala. She gave an example of girls who go to use toilets. She said girls no longer go on their own because they are afraid of being kidnapped. They are afraid of being raped. So, for her, she was only looking at the toilet issues. That these girls have to first gather themselves to go and use the toilet. She was only advocating for girls in Kampala about the security. Here we are fighting poverty, we are not begging for money and we are not begging people but we feel that we can do it ourselves. Why don’t they support us like giving us the tools and we use the tool to protect ourselves including the life of the others, I would prefer it this way. I don’t know if the lady from Plan International had really to go down to the grass root. The people at the high level always get statistics. These statistics don’t reflect what is on ground most times. For me who is on the ground, I would still say they should go to the root causes of all these problems. Girls should be sensitized not to fall prey due to poverty, they should seek on how to address these problems. Majority of the girls who have been kidnapped and killed are from the university. These girls should also be sensitized about love issues, here you find that they are tricked into love affairs just because they want gifts, money and many other needs. They should be taught, just like they say “give someone a hook to go and fish, teach someone how to catch fish and not to only eat fish or be given fish each time he/she is hungry.”. Or else it creates a dependence syndrome. This takes us back to the discovery of ones’ self. We should always educate the young ones who are falling prey of this situation. This lady should let her organization and all her stake holders get down to the root causes and then sensitize the girl, educate them to become aware of themselves. Let them discover themselves and let them know who they are. The moment they discover themselves, they will avoid all these other problems like kidnapping. If you know that your life is precious then protect it. These organizations should go and collect data from the field and find out more challenges faced by the vulnerable. How can someone archive this self-discovery? What does this self discovery mean for you? First of all, you cannot discover yourself on your own, you need someone in your life you need someone to look at, someone needs to educate you. So, when I discovered myself, I became happy. I feel that as much as I have discovered myself, it’s not enough. I want to rediscover more and its really beautiful to live this way. It is not that when I discovered myself all the problems disappeared, my problems continue, I will continue having the problems that have been having before and these problems will not go away. For me reality has taught me to live my life in a more meaningful way and that is what am doing now. All our value is greater than even what we have that is to say my value is greater than the sickness, my value is greater than everything that am going through. My names are Ola Ambrose, I reside in Acholi quarters Kampala but I was born in Pader district in northern Uganda way back in 1995 that is on 8th of June, I was born in a village called Lee Ogweyo that is in Pader. It’s been quite a lot have passed through to reach where I am right now. My father was shoot dead 6 month before I was born. I have lived with my mother since I was born till 2004 when she was killed by HIV/AIDs. We became orphans six in number born from the same mother. The first born was married in a village somewhere in northern Uganda. It wasn’t easy, first of all my father died even before I could see him. I stayed with my mother for quite few years and then she died so we remained alone as total orphans. My mother died in 2004 and life wasn’t easy, with the help of God we managed to overcome some of these circumstances. Our elder sister who was the first born of the family was married somewhere but since we were young we didn’t know but as we grew we started realised that she was married. After the death of our mother, they told her (Oldest sister) to come from where she was so as to take care of us since we were suffering and all alone. She had to first agree with the family of her husband if she could leave and move with her husband to central Uganda, but the husband disagreed. So, she left her husband and came and started taking care of us but we were young and my sister was also very young. She helped us cope up with the challenges we were facing. In which year did you come to Acholi quarters? We came in 1996 when I was one year old and my mother came along with us because of the war that was taking place in northern Uganda. She brought us to Kampala and we resided in Acholi quarters beginning in 1996. We came as a family because it our mother who brought us we were very young children so she just carried us and brought us during the war. What was her source of income for a living? Our mother when she was still in northern Uganda, she used to have a restaurant. She used to cook but the challenges she used to face that time was, some of the food used to be eaten by the rebels. The rebels used to eat her food and some could not pay. So, the day she denied rebels food, they came and found that she had never prepared food, then they went away. My mother realised and told everyone from the village to depart, to run away because she sensed something, so that’s how she escaped and brought us to Kampala. So, when she came to Kampala, she used to go and pick the food that she used grow and brings them to Kampala in a while. She brings them and sells then from there the war became too much so she decided to stay this side and she changed her occupation. She resorted to stone quarrying, stone mining, she also started buying food items from Nakawa a market in Kampala then, sold them in Acholi quarters to other people in the community. When you came to Kampala, did you start schooling? When I came to Kampala I was not schooling at the beginning but after sometime, my mother took me to a Universal Primary Education (UPE) school that was free of charge near Acholi quarters by then. The school which was called Kireka barracks. That’s where I used to school with other friends of mine and some other big brothers of mine so we used to go and school from there. How did you encounter Meeting Point International MPI and in which year? I knew MPI in 2018, that’s the year I knew MPI and it was through madam Teddy. When I was still a kid, I used to see MPI. We used to come to MPI and they would teach us how to draw pictures. I grew up seeing MPI. I thank God that in 2018 we got in touch because Teddy is like a mother to us as well. So, she introduced me, my siblings and other friends of mine in February 2018 and all these happed through the activities we do at MPI that is yoga session, acro-yoga and health education that we were doing with the mothers there. How did you get the sponsorship at MPI? I remember when Teddy introduced us to MPI, we did a yoga session with the mothers like three times then Rose called me. She asked me to meet her and I accepted and asked if I could come along with my siblings. We met her the following day. When we entered her office, she welcomed us and we really loved it she was smiling. She asked us to introduce ourselves. We were three guys doing the sessions with the women, so we introduced ourselves. Talked about how we lived our lives and how we coped with school because some of us studied but due to school fees and tuition couldn’t go ahead. She told us to go to any school and get an admission. We came out all us just smiling at each other very happy. That’s how the whole sponsorship came in. What really attracted you to MPI and why did you think you were chosen? First of all, when we came to do the sessions, what really inspired us was because we had passion in what we were doing, we loved what we were doing so it really inspired us. 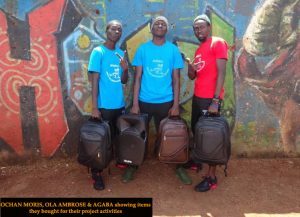 What inspired us was seeing the young people of Acholi quarter having the potential to do something to our mother, we had the potential to give back to our mothers. It might not be financially but we were boosting the health of our mothers through the sessions we were doing. In this we had the of yoga, acro-yoga and health education plus some other parts of also dancing with the mothers. In that process the mothers started gaining some changes in their health status so Rose was very happy because she saw the passion we had, she saw the motivation we had and when reached her office, she told us that is very rare to find young people like us doing whatever we have been doing. What do you do currently for a living? Currently, I am unemployed but I just do casual work, any kind of work which can at least earn me a living. I just do pottery work like helping builders at construction sites. It’s not a permanent job so you can even work a few days then wait for another chance. So, in this construction sites you have to do any kind of work. I used to do all kind of work that was really required of me so I did any work available so long as it could help me and my family. This brought contribution because we help each other. That’s how we survive though it’s not easy but that’s how we try. Do you have any other activity that you do besides the construction work? During our free time, we normally teach the community just like we normally do with the mothers. 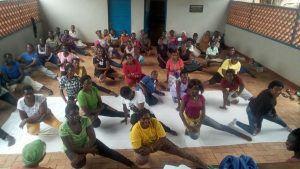 We don’t only do it the mothers, we do it even to the whole community like even teaching the young people as well so we do the yoga, acro-yoga and health education with the community too, leadership and communication cycle that is we do it as a project. We do the b-boy dancing with some few youth and kids who got inspired by what we. This is mainly to promote togetherness among we the young people and to teach the young people good morals and values in their lives. At first when we just began this activity we had a lot of criticism in the community were most parents were against us thinking that we may mis-lead their children but latter they realized the benefit and started to send their children in large number. Can you tell me about how your project began and how you manage it? We named our project New Hope Dance Project Uganda. It’s a project that came out of passion. For the love, we had to learn certain things. We always moved around to learn new things like the dances. It was a way of killing stress. When our mother died, we used to find possible ways to relieve ourselves from stress. So, we went around and started learning the type of dance that our friends introduced us. We started copying up with the dances slowly until 2009 when we formed a crew. We used to perform around and earn some little money and balance it with other jobs. 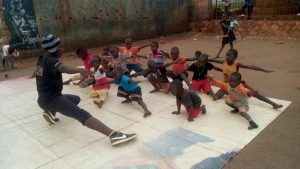 We had to get other possible ways of earning some money like learning more of the dances, yoga, acro-yoga and some other activities like leadership skills, community saving, community sanitation then later in 2016 we formed the project officially we called it New Hope Dance Project Uganda. That’s when we opened and started teaching the community because we believed we had gained enough skills to share with others so, we started teaching the young people in the community and other people outside our community. In February 2018 Teddy who was our good friend also introduced us to MPI so we started doing a session with them as well. That’s how we started running the project. It was passion that made us do all these. Do you have any support from any organisation to help you in this project? We never had support but thank God we met MPI and they really appreciated the work that we were doing, they helped us with certain needs that we really wanted for the project since we lacked certain things like speakers and uniforms. So, they offered us some funds which we used to buy speakers, uniform, shoes, we bought a camera. We really working with MPI. What inspired you to really open up this project? At the beginning it wasn’t a project because we were just doing everything as a way of relieving stress after our mom’s death because after our mother’s death we were just trying to cope up with the new life when things were not easy. So, friend of ours introduced us to dancing so we started coping with the dancing slowly. We used to be relieved so we continued dancing. With that inspiration we got from friends around, we started learning how to dance. We also got inspired by prominent dancers like the late Michael Jackson, Usher Raymond and Chris Brown. We used to watch videos and copy some of the styles of the dancing. We never had access to dancing schools so we just learnt from friends. We used to move far from Acholi quarters to look for friends who had more ideas in dancing. And how about the future goals for this project? First of all, we are so happy that MPI has gone ahead to help us with the project, Rose plus the entire MPI offered our project 3,000,000 Ugandan Shillings to buy our necessities. So, we bought shoes, clothes, carpets, radio and these days we just love to train. In fact, we got more motivation to create and to share and in fact even our project has grown bigger. We were so happy for that. We would like better training ground such that we can engage more people from the community. Then we are also looking if there is a possibility of our project getting into an entrepreneurship. In a way that we are taught entrepreneurship skills such that we can have some businesses for the project so that we can become self-funded. On 25/05/2018, there was an event in Hong Kong, “Africa Day Hong Kong 2018”, Meeting Point International was represented in this event. This was through a relationship with Jinja limited. Find out about the woman behind this and how it all started. 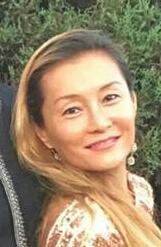 My name is Rosa Huang-Rierson and I am a social entrepreneur, I am building a small company, a small business here with the aim to provide employment and training, but very much by exporting products that are going to make money. Otherwise I don’t believe that in a sustainable way create some real livelihood to support in a long term for people. So, this is what Jinja Kimala limited is about and this is what have I been working upon in the past nine months to twelve months because there was a lot of preparation we were doing. I leave between here (Kampala) and everywhere because I travel a lot. so, my husband is here with my daughters but because of the business I need to travel quit a lot to be meeting clients and to understand what the market demands. Everything that I will sell in future wont be in Uganda and not in Africa and I will be exporting to other continents. One of the co-mission of the company is to really have a lot of the value in Uganda so I want to export finished product not raw material or ingredients. I want to export product that are handmade here but designed from somewhere else and the hand made part will be here for sure, the packaging will be here possibly everything will be here as much as possible. it is a challenging business model because most people make money by selling big volume of raw material but less work but for me I want to be true to the social mission. This is a company that is not only going to be making money but making money with a purpose. Do you have a fixed range of products that you that you work on or you cut across? I have two categories of products right now, one is organic dried fruits that are actually certified organic with certain farmers in Uganda. Second category home wear and other objects that are functional for the use in homes and that are using materials from Uganda. Speaking of this, Initially the design is outside Uganda so I have a designer in London hopefully in the future some of the design can also be designed here. The reason am trying to combine western design for western test with local material is to know the different choices because not everybody likes things that looks too African. and I don’t want to create souvenir that you bring back when you come to safari. I really want to have people see these objects and say wow they are beautiful not knowing where it comes from unless they really look and then understand that is coming from Uganda. So, two main categories of product. How did you encounter Meeting Point International? I was introduced to meeting point by Italian friend. 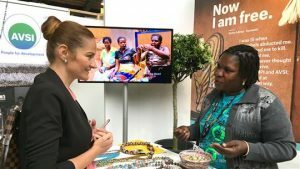 She was working and volunteering at Meeting Point International (MPI) and she talked to me about a bark cloth. At that time, I thought the bark cloth was very interesting and I wanted to initially do bark cloth. But after a lot of investigation and a lot of investment to try to understand what was required to make some beautiful products, I decided that I would wait a little bit because the required investment is too high and also the risk is very high too. So, I start first with paper beads and painting with MPI and I worked with MPI for almost a year initially on bark cloth and now on paper beads and painting. That event which you had in Hongkong were you displaying some products for MPI? What was the main purpose? Why did you choose to fund raise for MPI? Because this Hongkong client is already commissioned for work for a mural and she’s also a close friend of mine. She believes that we could do a mural using paper beads. Initially she wanted us to finalize the mural by the end of May and I told her it was too rushed because the 24th of May is when the event happened up to 25thmay. We had not even started the design so I had to push back and I said its too early but what we can do we can be represented. The event on the 25th was an event that she was organising with the board of investors of different African countries and Hongkong, a lot of artists, a lot of NGOs as well as refugees in Hongkong. She’s also helping a lot of African refugees in Hongkong by giving a job for them in the kitchen, help in cooking food so she’s helping a lot of the local NGO. She reached out to me and said “okay for the mural, there is not going to be enough time but at least we can do something that introduces Meeting Point International and Jinja Kimala so that my clients and my supporters know what is coming.” and then for that we basically decided that we will make something easy. I discussed with Alberto (Technical Adviser at MPI) to reuse some of the paper beads that were already made and we did something for decoration. So, people could look touch and ask questions about it and also, they would see logo of MPI. There was a little bit of information about who is Meeting Point International. And about how Jinja Kimala will reward MPI, we basically try to find project of product and then we the ladies basically provide the labor and the livelihood on a daily rate. All of the materials we purchase, so there is no risk and so the ladies do not need to go and buy the materials, do the design, do the further things. So, the relationship between Jinja Kimala and MPI is that MPI provide a talent pool that we trust, that we understand through Rose Busingye and though Alberto, they tell us who is good to work with us. They will be trained and all of them will be there and we understand that and we want to give more work for the ladies of MPI. You are concentrating more on not making so much money but to empower the person who is also working for. Why is this so interesting for you, why do you choose this approach? I was definitely very inspired by Rose and Alberto and also the ladies that I work with that is Agnes, Catherine. They had suffered a lot but they have retained that self-respect and they have retained that desire to work hard, to earn respect and earn what they do by working well and I think it’s quite rare for an NGO because have seen a lot of NGOs that are forward NGOs. Very good-hearted westerners who come here and say ooh I can help this family that way but its very difficult because these westerners don’t often understand what the local uplifting means and I was inspired by Rose and her story of how over 25 to 27 years she built slowly -slowly this friendship and relationship with the ladies. So, it’s not an NGO that just like 1 year, 2 year, 3 years, 5 years or 10 years, it’s a whole life time. What have you learnt from this relationship with MPI? The women have gone through a horrible side but in spite of what has happened to them they still have the self-respect and have a value as a human being. The women focus on the positive side of life no matter what happens. Everyone has a good side and a dark side and Rose is focusing on the beautiful side of life which is helping the women to overcome their challenges.